Slim light up rocket shape ballpoint pen. Real Time Voice Chatting -- Recording and sending Voice message . Family Number--You can set 10 family numbers(father/mother), 3 SOS number and 1 monitoring number. Safety Area --Delimit An Area On the Map By APP,alert will happen Once Your Kids Out Of The Zone. 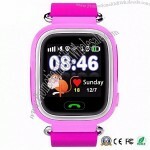 Find The Watch--enable this fuction, the watch will alarming and you can find it easily. Making Friends--Two watch meet together can add each as a contact can Calling and Voice chatting. Remove Wrist Alert--The watch will send message to monitor number when watch been taken off. Add Device--You can added another device here and manage two different device in one account. Historic Route Replay-- With locus,you can track movement route within 30 days. Mode Setting--You can choose two different mode, power saving mode makes longer battery life.tracking mode will have more tracking location but takes more power. Alarm Clock--3 separate alarm clock to meet your different demand. Voice Monitor--The watch need to set monitor number firstly.After give monitor command,dial to monitored number. Geo-Fence--You can set a Geofence for your children on this gps watch, it will sent alarm onche the child is out of the fence. Application--Click the application button and you can set the name of your device, family number,change password and so on functions. Health --Including step count,amount of Excercise,sports journey.add 3D sensor inside watch,it will count steps intelligent while work or run. SOS Alarm --Kids could long press the SOS key for help when they are in danger.